DISCLAIMER: For your protection, we expect each young person to conform to the rules below. Any rule broken, aside from having fun will be grounds for dismissal in which the parent/guardian will be called to pick-up his/her child from Matthews Memorial Baptist Church or the event location. 4. respect and comply with events/activities scheduled. 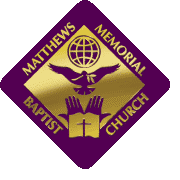 NO ELECTRONIC DEVICES AT ALL: Cell phones are permitted; however, if a device is lost, neither Matthews Memorial Baptist Church nor any leader will be responsible for ANY replacements.